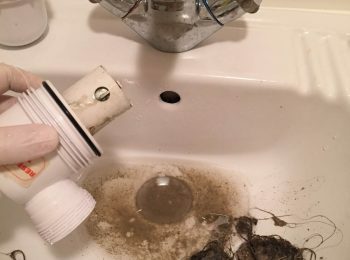 Just as with most things in life, unblocking a sink can seem a little daunting, but with a little know how and DIY skill, you can save yourself some money and do it yourself, quite easily. 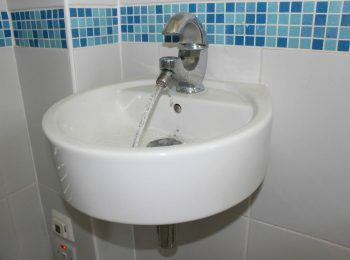 All sinks and wash hand basins in the UK are fitted with what is known as a trap and this can be found under the sink, fitted directly to the waste outlet. There are several types of traps used, the most common being bottle traps and P traps. One looks like a bottle and the other looks like an inverted P, they both do the same job but bottle traps are usually fitted to basins, where space is at a premium, whereas P traps are usually used on sinks, giving better flow characteristics. The trap is in place to stop smells from entering your home from the main sewer by continuously containing water in the bottom of the trap and each time the basin is used this is replaced. The other function it performs, is to stop matter from entering the outlet pipe, causing a blockage which will be harder to clear than if it is contained in the trap. It is in this trap that the most common blockages will occur and this may be caused by a build up of hair, fat or just a build up of debris from the daily use of the sink or basin. Clearing this type of blockage can be quite simple, the access to it being the hardest part of the job in some cases, but once you can see and get to it, it really is quite easy. The fittings and seals of a household trap are all done up or dismantled by hand and rarely need any tools to work on. Firstly, you should put some type of bowl or container under the trap, as there is water contained in the bottom of it and when you dismantle it, this will spill out and need to be contained. If the trap is a bottle trap, it should be possible to undo the bottom of the trap by unscrewing in an anti clockwise direction without detaching it from the sink and pipework. 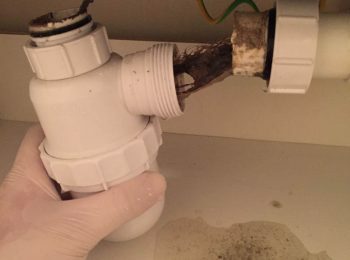 In many cases, cleaning this out and replacing it could well clear the blockage, but if not, you may have to remove the trap from the sink and pipework by undoing the large nuts on each. Once removed, you can rinse the trap out and replace it, being careful to make sure that all of the rubber seals are in their seats and not twisted or split. A P trap, usually needs to be removed completely, again by undoing the two large nuts securing it to the bottom of the sink and onto the pipework, cleaning it out and replacing as per the bottle trap, ensuring that all of the seals are in place and seated properly. Once you have cleared whatever type of trap you have been working on and replaced it, you don’t have to over tighten the securing nuts as this may distort the rubber seals. Its usually best to tighten moderately and then run the water to observe how well the trap is sealed. If you witness any drips, you can tighten the nut further, but not excessively, to avoid distorting the seals as mentioned. If you still have a leak, the trap may well need new seals, these can be bought from any plumbers merchants quite cheaply. The pipework for a wash hand basin is typically installed in 32mm pipework and a kitchen sink in 40mm pipework, the seals and traps for these being the same size. If in doubt, a new trap, complete with seals can be bought at the same merchants quite cheaply too and this option may just make it a little less complicated if your worried about fitting new seals and the various sizes, but if you take the old trap to the merchants, they will match the seals or trap for you, taking some of the guesswork out of it all for you. If after all of this, the sink or basin still doesn’t run properly, the problem is probably more deep rooted and require us to clear it with any number of tools at our disposal, but its always worth trying to clear the trap in the first instance as if this does the trick, its cost you very little and added a new skill to you DIY repertoire. Good luck, and remember, we’re always here to advise and support you and if the worst happens, clear you drainage problems for you.